This 90? 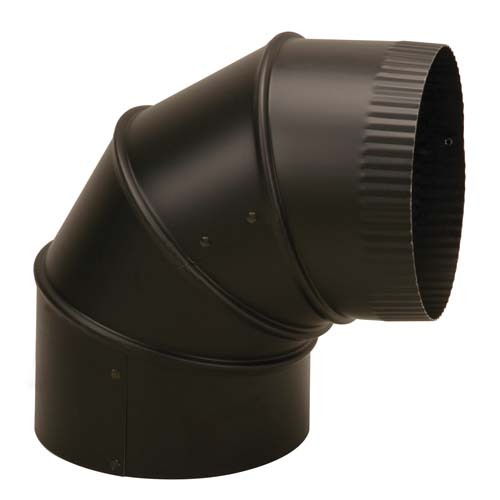 stove pipe elbow is adjustable for ease during installation. It is a rigid elbow made of 24-gauge steel. An 18" clearance to combustible materials must be maintained because the part is not insulated and you should deduct 1 1/2" from the actual length to calculate the installed length. The part is available in diameters of 6" and 8" to match the common sizes of stove pipe and it carries a 1-year manufacturer's warranty. Will this item work on a wood stove? Yes, this is a chimney connector (stovepipe) elbow meant for use with other 8" diameter components made by Imperial. Could I get this elbow with 2 male ends? No. However, a 5 bladed pipe crimper can be used to crimp the female end of the elbow. The crimper will be available in the HVAC section of your local home improvement store.